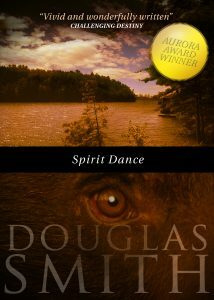 “Spirit Dance” first appeared in Tesseracts6 and won Canada’s Aurora Award in 2001. It has since been reprinted in seventeen languages and twenty countries. If you enjoy this story, check out Doug’s novel, The Wolf at the End of the World, which picks up events five years after “Spirit Dance.” In it, we again meet up with Gwyn, Gelert, Leiddia, Ed, and the Tainchel, and Gwyn faces more shadows from his past. “Four years since you left Wawa.” He took my offered hand in a strong grip. “Good to see you, Ed,” I said. “Yeah. I made you up some supplies and a map to the truck driver’s cabin.” He nodded toward a small pile of brown paper packages in the corner, wrapped in twine. “Why?” I asked, puzzled. The Muskokas were a cottage and resort district a two-hour drive north of Toronto, and a good seven hundred kilometers from Wawa. He held up a finger for an answer and started flipping through the newspaper. Gelert curled beside our supplies. I waited, sifting through the smells of grains and fruit, wood and burlap–and humans. Vera was muttering in the storeroom at the back. I could have made out her words if I had wanted to, but I didn’t. Footsteps outside announced a customer to me before the bell over the door brought Ed’s head up from the paper. She looked early twenties, tall and slim with gray green eyes and long dark hair that wasn’t sure where it wanted to rest. Flashing a quick smile at Ed, she moved to the shelves of canned goods. “Morning, Leiddia,” Ed said, eyebrows shooting up. “Morning, Ed,” she replied, then looked at me. A familiar aura tinged her outline. She kept looking as I turned back to Ed. The woman Ed called Leiddia turned toward Ed, but I could feel her eyes still on me. I didn’t look at her. I had heard about the truck incident three days ago. Conrad had been chairman for a company that owned the paper mill outside Wawa and several logging operations north of Lake Superior. Recently, the company had faced escalating pressure from local residents, native bands, and environmental groups. Protests centered on the company’s clear cutting methods and general contempt for the old growth forest. The confrontation climaxed when a group of students and other protesters blockaded the road leading to the current clear cutting target. The first truck to reach the blockade had backed off, driving fifteen miles back to camp in reverse. Two hours later, the next truck arrived. This one hadn’t stopped. The kids hadn’t used logs or fallen trees to block the road. They hadn’t piled boulders, or sprinkled the road with tire punctures. They had just stood across it, arms linked, singing. The truck slammed into them, killing three local students. A female protestor from out-of-town also died. “Five hundred dollars,” said Ed, shaking his head. “I went to college with one of them,” Leiddia said quietly. She shook her head. “My stepfather works in the mill. He wouldn’t let me go.” She stared at me hard. “You know Robert?” she asked. She didn’t look at him. “I’m coming,” she snapped, thumping some cans on the counter. As Ed rang up the order, I looked the man over. Late forties, maybe six feet, a paunch and thinning black hair slicked back. Gelert growled at him, and I didn’t stop him. I didn’t like his smell. Leiddia paid Ed, took the bag of groceries, and turned to the door. Not waiting for her, the man let the door slam, walked to a beat-up Cutlass parked in front and got in. He had never even looked my way. As Leiddia shifted the bag to her other arm, I stepped past her and opened the door. The car’s horn blared. Jumping out of the car, he moved quickly toward us, fists clenched. “Damn it! What’re you doing?” he snarled at her, then spun to face me. “Who the hell are you, mister? I…” His voice trailed off. “Uh, yeah. Uh, Leiddia, don’t be too long. I gotta get to work.” He turned and got back in the Olds, with a glance over his shoulder. “I’m camping by Deer’s Pond. North shore,” I said. Smiling a cat-with-the-canary smile, she strolled casually to the car and got in. They drove off, and I went back inside. “So what do you think of our Leiddia?” Ed asked. “She has the Mark,” I said quietly. Opening the door, I stepped out into the street after Gelert, not waiting for Ed’s reply. The first frost had come to Wawa early. Gelert and I hiked back through fall colors, crisp air, and no mosquitoes, reaching our campsite overlooking Deer’s Pond just before sunset. That night, spirits of the firelight danced around me through the trees as the rising moon silvered the smooth surface of the water. With Gelert snoring softly beside me, other spirits danced through my thoughts. I didn’t want them to dance. I didn’t want them to even exist. But spirits have their own views on these matters, and are very persistent when they feel it’s time for a performance. These ghosts went back fifteen years. The prompting for tonight’s tango was much more recent. Three days before, I had been many miles north. That day, I had stood by the heavy wooden railing of the broad stone promenade running the length of Cil y Blaidd, watching a small seaplane shatter the glass of the lake below. Part carved, part hung from a rocky slope of forest, Cil y Blaidd is a sprawling wood and stone structure overlooking a lake in far northern Ontario. The name is Welsh, for Wolf’s Lair. Built to my design years ago as an occasional retreat from civilization, recently it had become my permanent home. Or perhaps it was my act of retreat that had become permanent. Accessible only by seaplane, Cil y Blaidd is invisible from the air. Those who had built it had been flown in at night, stayed until completion, and then were flown out again at night. I had piloted the plane. Only three other people knew its location. As I watched the plane taxi to shore, I wondered which of the three it carried. The plane pulled up to a long dock hidden from above by arching willow branches. A huge male figure emerged and strode along the dock to stone steps carved from the cliff face. Well, it’s not Estelle, I thought, ignoring the resentment this brought even after fifteen years. Too far to see if it was Robert or Michel. My visitor looked up, searching the slope as he climbed. Our eyes met and he raised a meaty hand to remove and wave a cloth cap, revealing a mass of red curls. “Lo, Mitch,” I called down as I waved back, wondering briefly at my feeling of relief. Turning from the railing, I headed through the house to greet Michel Ducharmes, the Red Bull, and current head of the Circle of the Herok’a. Opening huge oaken front doors, I stepped out onto a graveled path as he emerged from the woods trailed by two great stags, their antlers barely missing trees on either side. As Mitch shoved out a hand to me, the stags turned to the forest, lowering their heads toward trailing gray shadows. “A fitting honor guard,” I commented. “They felt I needed protection from your troops,” he replied, jerking a thumb at six timber wolves hovering at the tree edge. “Garm, Fenrir, take off. He’s a friend,” I said, addressing the two largest wolves. They glanced briefly at Mitch, then all six padded into the forest. “Maybe the MOE needs better computers,” I offered. I shrugged, not rising to the bait. “Seen Robert lately?” he asked, too casually. He sighed and nodded, suddenly looking very old. I had never thought of him as old before. I shut up then and listened as Mitch told of the logging protests, the blockade, the protestors’ deaths, and of Robbie’s threat to kill Conrad and the truck driver. He talked and pleaded, pleaded and talked. Involuntarily, I bared my teeth. Damn it. I questioned him on his source, what evidence he had, how recent was the tip, but he knew he had me. Finally, I’d agreed, because of the Tainchel angle, and because Robbie had been a friend and Mitch still was. That’s what I’d told myself at the time. Now, watching the spirits dance in the firelight, I knew I’d done it for someone else. Estelle and I had been an item for quite a while, back when I ran security in the northeast. For centuries, the Herok’a were nothing more than creatures of legend. Security had mostly amounted to making sure things stayed that way. Then came the Tainchel, a covert operation of the federal intelligence agency CSIS, formed as we later learned, with the single goal of tracking down and capturing the Herok’a. For scientific purposes. Tainchel. Old Scottish term: Armed men advancing in a line through a forest to flush out and kill wolves. We lost quite a few before we caught on. They’d developed specialized scanners from tests on early victims. Subtle differences in alpha wave patterns, infrared readings, and metabolic rates gave us away, even in crowded cities. Then they got careless, and we became aware. I leaked word about a meeting that the Circle of the Herok’a planned for an isolated spot. At the next full moon, of course. I figured they’d expect that. Twenty of the Tainchel walked into the ambush, armed mostly with tranquilizer rifles. They didn’t walk out. They’d encountered the Herok’a before, but never predators. Wolves, bears, the big cats, birds of prey. We didn’t take prisoners. They backed off. CSIS disbanded the Tainchel, and an uneasy truce began. The truce lasted. Estelle and I didn’t. She argued against the ambush, the killings. I argued that we fought for our existence. In the end, we just argued. Robert and I had been friends for years, and through me, he had come to know Estelle. After I exited the scene, the two of them became more than friends. About then, I resigned from the Circle. Robbie replaced me there too. Dance, spirits. Dance with the beasts of the night. Growling, Gelert turned toward a dim rustle in the forest. I gave the dog a mental command to lie down again. Stealth was not my intruder’s aim. I stood as Leiddia stepped out of the trees, stopping at the edge of the firelight. “You don’t seem surprised,” she said as she approached. I told her, and she made a face. “Gelert was the legendary hound of Prince Llewellyn of Wales,” I explained. I grinned back. In the store, I’d been so intent on her aura of the Mark, I’d overlooked how attractive she was. Gelert liked her too, always a good sign. I smiled. That was Robbie–the size of a grizzly, but women treated him like a big teddy bear. Without a word from me, Gelert trotted to my tent and emerged holding a cup in his mouth. He dropped it in my hand. “Yes. Yes, you do,” I said quietly. “Then I’m one of you?” She leaned forward quickly, spilling coffee onto the ground. She got up then and walked to me slowly, as if trying not to frighten away an animal that had strayed in from the forest. She sat beside me, her leg brushing against mine, her breath cool and sweet on my face. I noticed something else. “Your cheek,” I began, reaching out. Wrapping my arms around her, I held her for a long time, neither of us speaking. Technically, I had to petition the Circle first, but I was never much on policy. To me, it was her right. I thought of her mom and Tom Barker. I thought of Tom with her. Several variations later, we were both asleep. I awoke alone except for Gelert, which wasn’t what I’d had in mind. Over breakfast, I pondered whether I felt used. She was a big girl. She’d known what she was after. She’d gotten it. Used. I shrugged mentally. Not the first time. Leaving Gelert to guard the plane, I broke camp and set out immediately for the driver’s cabin. I wanted daylight to scout the area, and assure myself that this was not a trap. Mitch and I had divided Robbie’s two targets. Mitch had planned to cover Conrad in Toronto, while I watched the truck driver, since I’d lived here after Stelle and I split. That was our plan four days ago. Somehow, Robbie had known Conrad would be away from Toronto that night at his lodge in the Muskokas, and had killed him there. Once Mitch heard of Conrad’s death, he’d head here, but Robbie had a full day on him. Sunlight filtered through the canopy of trees, warming the crisp fall day as I followed familiar forest trails. My thoughts kept drifting to Leiddia and last night. Ed’s map was clear, and I made good time, reaching a rise overlooking the cabin by early afternoon. Finding a spot with good cover and a clear view of the building, I watched, listened, and smelt the breeze. I repeated this process at three other locations before I was satisfied. The driver was there, plus three men with rifles. Conrad’s death had not gone unnoticed. I could detect no one else. My plan was to intercept Robbie on his way to the cabin, away from the attention of the guards. My problem became figuring which route he’d take. Three sides of the cabin were open field. Approaching undetected required coming in from behind, moving down through trees from the rise where I now stood. Undergrowth choked most routes to the rise. The best path followed a forested ridge, where the forest floor was clear under the roof of trees. I picked a spot giving a view of both the ridge and the fields surrounding the cabin, and downwind from the ridge path. After a snack of dried beef washed down with warm water, I settled behind a huge fallen tree to watch, wait, and sniff. One hour. Darkness. Two hours. Moonrise. Four hours. Predators are used to waiting. I spent the time thinking of Leiddia. Her face and body kept shifting into Stelle’s. Midnight. The cry of a screech owl brought my head up. I shivered in the cold. The owl. A symbol of the souls of the dead in Indian myths. Shamans gave owl feathers to the dying to help them pass into the next world. Just then, I caught a whiff. A minute later, I saw a huge shadow moving steadily along the ridge. For a moment, I thought I saw two shapes. Must have been the light. I watched long enough to guess his route, then moved to an intercept position. Hidden, I listened. Twigs breaking, leaves rustling. Closer. Footsteps, breathing. I stepped out in front of him. Startled, he stopped, dropping back into a defensive stance. Suddenly, I became aware of something some distance behind him. Something big and moving fast. And growling. “Robbie! It’s me, Gwyn!” The grizzly closed on me quickly, while I assessed the best tree to scale. “Callisto! Halt!” Robbie’s voice ripped the night. The huge beast rumbled to a stop at his side, snorted in my direction, then settled back on its great haunches. “Too long, Robbie,” I said, trying to sound more casual than I felt. “No. No, I didn’t think so,” he said sadly, then his face hardened. Pouncing with a speed belying his size, he caught me in the chest with his shoulder, knocking me to the ground. I rolled and sprang to my feet. If he pinned me, it was over. We circled each other. “Can’t we talk?” I gasped, forcing air back into my lungs. He tried a foot sweep. I backed away. Apparently, he was keeping his teddy out of it. Maybe he wanted a fair fight, which would be like him. Maybe he was worried I might have some reserves too. About then, I was wishing I’d thought of that. Robert was a grappler, a wrestler. My style was karate–blocks and strikes. Not needing my hands to grasp meant I had an option he didn’t. Staying in a left fighting stance, I moved my right hand closer to my body where my left arm hid it. Slowly. Concentrate. Keep circling. Gradually I felt it work. Now, I had to use it without killing him. I didn’t get a chance to reply. He moved in, feinting a high punch, then dropped his shoulder and threw out an arm to circle my waist for a takedown. I sidestepped and blocked the arm, spinning him around and exposing his side. I drove in with my right hand, aiming for the shoulder. A useless target for a normal strike. But not this strike. Three inches of claws sank into flesh and muscle. A cheap shot. In tournaments, you must announce or display shifts. This wasn’t a tournament. He roared, spinning free but tearing open the wound. He stepped back groaning, left arm limp, useless. The grizzly growled but stayed put. “It’s over, Robbie,” I said softly, shifting my hand back to normal. “What the hell are you talking about? Nobody’s killing anybody. What’s with you? Stelle’s going to flip! She hates killing. You’re going to break her heart, man.” Like I did, I thought. He stared up at me, the strangest look on his face. Something must be added for what was lost. A chill filled my belly. “Gwyn,” he said. His voice was gentle. A lot of us are activists. I got Stelle into it. A female protestor from out of town also died. He dropped his head sobbing. I stood there, feeling like the leaves at my feet–brittle, broken, dead. I got Stelle into it. Mitch. He’d known, of course, but he needed me to stop Robbie. Isolated and estranged as I was from both Stelle and Robbie, he’d gambled on me not knowing. With one of the Herok’a already out for revenge, he knew that if he told me, I’d be racing Robbie to the kill. Now I did know. So what was I going to do? Standing there, I realized that I’d always thought Stelle and I would get back together somehow, sometime. I had never stopped loving her, never believed it was over. I shook my head, fighting the anger and the tears. Too much killing, she had said. I knew what she’d say now. I’ll never know who their first target really was. They must have held back after I appeared, hoping we’d kill each other. When we stopped fighting, they stopped waiting. I had just knelt to help Robbie up, when the bullet caught him in the bad shoulder. He took another in the chest before I pulled him to the ground and threw myself flat. I looked back in the direction of the cabin. A line of figures was moving toward us through the trees. Figures with guns. “Those aren’t trank guns,” he groaned. “I think they’ve given themselves a new mandate.” They’d be on us in seconds, but I couldn’t leave Robbie behind. “Just…bought you…some time,” Robbie gasped. The next second I knew what he meant. Sixteen hundred pounds of furred fury burst from a thicket. Charging into the nearest group, it grabbed a man in its jaws and threw him against a tree. Rearing up three meters on hind legs, Callisto sent two more spinning through the air with a slashing swipe of her paw. I shook my head. Bodies at her feet, Callisto turned to charge another cluster. More fell before her. The rest were firing at the grizzly but still she attacked. The shooting continued, and she was slowing. Rushing another man, she reared to her full height and fell on her screaming victim. She didn’t rise. They put more shots into her. Silence followed. No movement. Callisto had made them cautious. She’d bought us time. Robbie was pale, breathing in rapid gasps. The Indians believed the bear possessed great curative powers. Robbie needed more than legends. I called out. “Listen to me! I’ll make this easy. Get my friend medical help, and I’ll surrender.” Robbie shook his head violently, prompting a coughing fit. The firing started again, heavier this time. Keeping my head down, I started to concentrate on a shift. It was our last chance. They wanted blood. Robbie grabbed my arm just as I sensed them. Too late. Something crashed down on my skull, and I slumped forward, stunned. Fighting for control, I managed to turn my head to look behind me. The firing from in front of us stopped. These two had used that sound cover to sneak up behind us. Focusing on my shift had dulled my other senses. “Silver bullet time, freak,” said the closest one. Grinning, he raised his rifle. With a roar, a gray mass hurtled out of the shadows. Huge jaws closed on the man’s neck with a sickening snap. A black blur pulled down the other gunman. Around us, the Tainchel screamed and cursed, dark forms leaping at them from all sides. My puppy had arrived, and he’d brought friends. Gelert shoved his face into mine, licking and whining. I could smell blood. Throwing an arm over his great back, I pulled myself up and looked around. The wolves outnumbered the Tainchel, but the men had guns, and their initial shock was wearing off. The survivors were in a clump, backs to each other, firing outwards. My gray brothers were falling, dying. Dying for me. I shifted. The Black Wolf came among them. I came out of it with Gelert nuzzling my face. A dozen wolves clustered around me, wagging their tails or licking wounds. Pain screaming from a dozen places, I rose stiffly but found no major damage. I remember little after a shift. Walking around, counting the dead, I figured it was just as well. Six wolves, eighteen of the Tainchel. No human survivors. Naked and freezing, my clothes shredded from the shift, I stripped one of the less bloody bodies for garments. He smiled. “You and I…always finding the same woman.” The smile faded. “Stelle…never stopped loving you. Sometimes…I hated you for that. Sorry.” His eyes closed. I felt for a pulse, but I knew. I could smell it. The Bear was dead. I wondered if he’d heard me. In a nearby clearing away from the trees, I built a low bier from rocks, piling it with dried branches. I dragged him over and with a great struggle lifted him on top. Beside him, I placed my dead wolven brethren. Callisto, too huge to move, I covered with rocks. A search of the bodies provided matches. As I returned, a great horned owl lifted up from the bier into the night. A single feather lay on Robbie’s chest. I held it for a moment, then tucked it into his shirt. I lit the wood and stood back as the fire caught quickly, roaring with the rising wind. Turning from the flames and smoke, I stopped, surrounded. Black bears, wolves, coyotes, foxes, animals of all kinds encircled the pyre. Gelert began a mournful howl, picked up by the wolves. The other animals joined with growls, roars, and snarls. Howl, beasts of the night. Howl for our fallen. Howl over the bodies of our foes. I walked away through smoke and mist and trees, Gelert at my side, until we stood looking down at the driver’s cabin. The guards pointed up the hill at the glow of the fire. One task remained. They had killed my woman. They had killed my friend. Gelert growled. I began to shift. A wolf howled. He said nothing, but pushed the newspaper forward. I read the front page. The bodies had been found already. I looked up. He had turned his back. Taking the supplies, I placed more money than required on the counter. “Probably for the best,” I said quietly. “Yeah. Assuming they can support themselves,” he replied, an edge to his voice. I walked to the door, not looking back. “Guess there’s one more beast in the night now,” he said under his breath. I’m not sure if he meant me to hear. As I stepped outside, I felt that Ed was making a warding sign, a sign to keep away the beasts of the night. I hoped I was wrong. It is night now. I sit in my camp and stare as the spirits dance in my fire. Feel their heat on my body. Feel my body an empty shell, hollow. Wait for the fire spirits to bake it hard. Wait for the animal cry in the night to shatter this shell, crumble it to dust. Listen to the wind that will blow the dust, scatter me, send me away. Stelle is dead. Robbie is dead. I am dead too. Perhaps I have been dead these past fifteen years. The wind stirs the ashes, dancing the flames. Gelert raises his mighty head to stare into the darkness. The fire crackles. A branch snaps behind me. I turn to see liquid night flow feline from the trees toward me. It shifts. It changes. Twin emerald fires melt to gray green eyes. Paws become hands. Paws become feet. Ebony fur fades to the pale smoothness of her skin, streams to the black cascade of her hair. Naked, she stands before me, cat-beast of the night now woman again. I walk to her slowly, as if trying not to frighten away an animal that has strayed in from the forest. Wrapping my coat about her, I stare at her searching for something there to fill this empty shell, and she endures it. “Then it worked,” I finally say. She whispers, “I love you,” as we lie down by the fire, and I say I love her too. I hope one day we can mean it when we say it, as I fill her emptiness, and she begins to fill mine. After, I watch her sleep by the dying ember light. Stelle is dead. Robbie is dead. But another of the Herok’a lies beside me. The spirits do not dance. For now, it is enough.